I’ve donated a screenprint to the Stockton Arts Commission for the 33rd Annual Stockton Art Awards – A Night to Shine… – to be held on Friday, October 1st at Stockton Civic Auditorium. Proceeds from the silent auction are used to fund a granting program for local artists and arts organization. This piece is from the Bridge Series; a grouping of works blending the imagery of teeth with that of monolith-like forms. As a artist with nocturnal bruxism, references to the grinding of teeth periodically occur in my work. The end result are dichotomic images, part tension & stress filled, part soothing path-like icons. 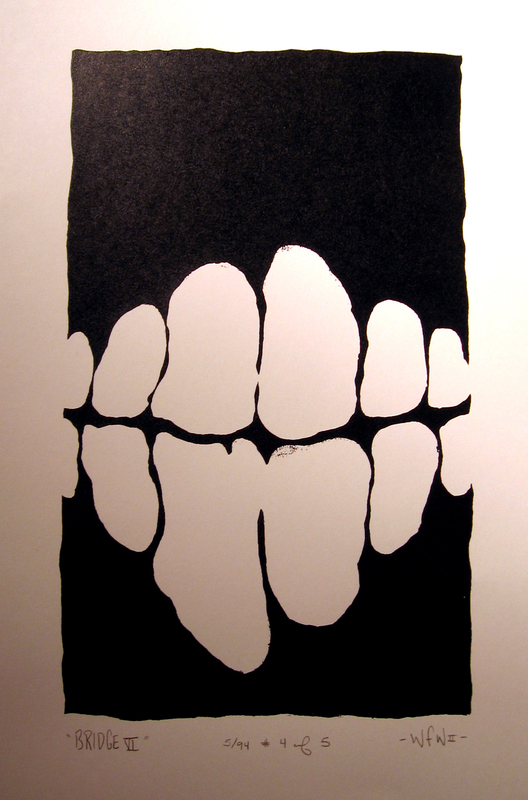 This entry was posted in Printmaking, Teeth. Bookmark the permalink.